Title: Owner, Buyer, and Stylist of the The Lowry Estate. The Lowry Estate sells vintage clothing and shoes for women. Specialized in festive apparel from the 70s – 90s, Corliss uses her distinct eye for culling striking, yet timeless apparel for clients aiming to enhance their individual style. Named for her grandmother, Mabel Lowry – a professional and independent woman who “traveled the world in Ferragamo and fur” – The Lowry Estate empowers women to confidently “own the room” with colorful statement pieces that they will cherish forever. NB: We love the concept and you yourself have great style! Can you describe it in a nutshell? 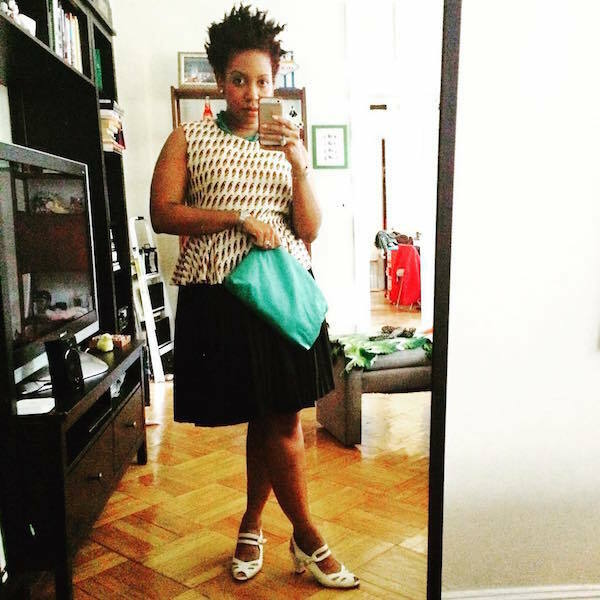 CEW: Ever since I was a child, I remember my mother and grandmother always wearing color. To be honest, I don’t ever think that I have ever seen my mother wear head to toe black. Black was always used as an accent. I picked up that sense of style, ever since I was outfitted as a child and it has certainly carried over in to my adult life. I would describe my style as “sophisticated-ly–playful”…I always make sure that I look good before I leave the house. People often ask me “why are you so dressed up?”… but the truth is, I enjoy pops of color and making sure that I wear clothes that always flatter and compliment me. When you look good, you feel good. NB: We agree, and of course we like to smell good too, so we have to ask, do you have a signature scent? CEW: My college roommate used to tell me that I smelled like soap. I’ve also gotten that from perfect strangers in passing which is weird. I’ve asked what kind of soap, and they say Ivory! I don’t use ivory soap, but I would much rather be known to smell like that than something else, I guess! In terms of the scent that I do actually use—I use Marc Jacobs Eu de Parfum. NB: At the time of the interview, we caught Corliss in her brand new showroom in Bushwick, Brooklyn. Sweating it out over IKEA office furniture and awaiting a much anticipated air conditioning unit. We were all glad to be far from some of NYC’s most notoriously smelly summer corners. But I’m wondering, how does Bushwick smell these days? CEW: Ha! It’s funny that you ask how Bushwick smells, because as I was working late in to the last night with a nice breeze with my window open, I got a whiff of pot, dog poop, and cigarettes. The fresh daytime smell of wood and paint from the wood shop next door transitioned in to that lovely scent which was a clear indication that I was working too late and that it was time for me to go home! I’m not joking about that! But in all seriousness, Bushwick is a breath of fresh air for me. Even though I live in another corner of Brooklyn, my husband encouraged me to take a space in Bushwick—and every day I am happy that I did. The neighborhood is percolating with creative energy when you cross paths with people, and I’ve also met other new business owners where I am currently in the process of opening my showroom to the public next month. I feel very fortunate to be part of a growing community of artists and small business owners. I am from Metro-Detroit originally and when I went back home this past July—I have to say that the energy of these two magical places truly mimic one another in terms of building, creating, and re-building—so Bushwick feels a little like home away from home for me. NB: What are your favorite things to eat and drink right now? Give us a taste of local Bushwick flavor. CEW: I am addicted to the Vietnamese Iced Coffee at AP café which is dangerously located one block away and I also love the dinner and cocktails at Montana’s Trail House! Another great breakfast/midweek brunch/lunch spot is Ghia Café. NB: Getting back to Lowry. I understand you had the idea back home, right? But it’s something you’ve been thinking about forever. 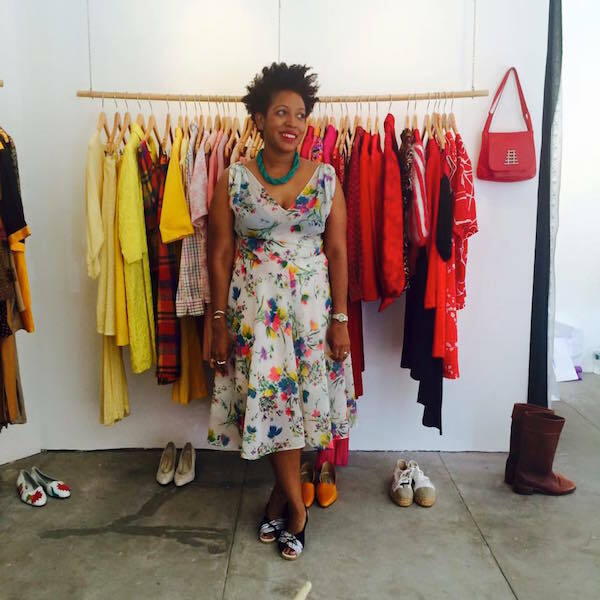 CEW: I have dreamt of owning my own vintage boutique since I went in to my first one when I was in high school. I remember my first vintage purchase so clearly. It was a super cute oxblood leather racer jacket with pleats that swiftly got stolen my freshman year of college at Pratt when I naively left it for two seconds to dance with my girlfriends at a danceclub in the LES. I cried, but never gave up on finding other vintage gems. I worked as an editorial designer and art director for over ten years, but always had the urge to have my own shop. Luckily, I have always had access to an abundance of family clothes from my mother, and over the years I have always been a massive thrifter. After trying out Etsy—my first attempt at an online vintage store that I called “Glittermini”—I decided to dig deep in to what my collection really meant to me, and it’s flourished ever since I decided to pursue The Lowry Estate. My grandmother, Mabel Lowry, passed away in 2007, but my mother Corliss Sheffield Williams who I talk to just about every day, has always encouraged and pushed me to do what makes me happy. It took a while to get there, but I am finally doing it, and feels much more natural to me than any of my publishing jobs ever did. NB: What better homage to strong and stylish women in your family! Tell us, in addition to style, did your grandmother have a signature scent? (Once of my grandmas smelled like Shalimar and Aquanet, the other like cigarettes and Bourbon, for example. CEW: To be honest my grand parents house definitely had a certain smell… but it’s hard to describe in words! The other day, I came across a garment bag of evening dresses of hers, and I was amazed that her scent was still there! I found it comforting. NB: What are some great stories associated with the pieces you have collected? CEW: I truly love how pretty much every article of clothing of mine has a story behind it. I have a few lovely dresses from when my mother and I went to Paris together that I still wear, several pieces of my mother’s that I incorporate into my own thrifting finds—and I also ended up with a ton of amazing costume jewelry that belonged to my Grandma. Girlfriends of mine and I have also hosted clothing swaps over the years which also creates an “all in the family” feel. I saw my good friend Jane a few weeks ago who upon greeting one another said “Hey! You’re wearing that necklace that I gave you!” and she flashed a big smile because I still had it after all of these years, and still wear it often. It is my intention to share The Lowry Estate pieces that I already have, and will continue to find to share with other women to enhance their wardrobes. Introduce women to color, patterns, and encourage them to leave the house feeling beautiful, empowered and confident. Wearing a piece that also allows you to keep and share a memory opens one up for new channels of conversation, and builds confidence. Own the room! The Lowry Estate will be at Brooklyn Flea (176 Lafayette Ave, Brooklyn, NY 11238) in Fort Greene on Saturday, August 15 (and 22nd) from 10am-5pm. Stay tuned for future pop-up dates and showroom opening details, which will be in early to mid September.